Last Wednesday the E.W. Scripps weekly columnist known as Victor Ashe wrote about Mayor Madeline Rogero’s comments about Ashe’s previous expose about some city funds not being expended as quickly as some thought they should for Legacy Parks. Ashe revealed that the information he had was only accessible to about 4 or 5 people. 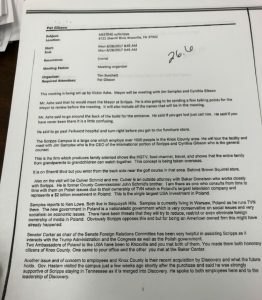 In recent weeks, I had obtained and reviewed open Record documents from the former Knox County Mayor Tim Burchett and ran across a memo where Ashe detailed that he is a Consultant to the Scripps television network and was coordinating a visit for the Knox County Mayor to visit the Scripps Interactive Network HQ and detailed previous activities the former Mayor had accomplished for the Scripps Network. Let us not forget, Ashe hosted a fundraiser at his home for the former Knox County Mayor and authored many weeks of favorable articles for the former Mayor and congressional Candidate in the Knox News Sentinel. I guess one could conclude who one of the 4-5 individuals that Ashe relied on for his information about the Knoxville funds for Legacy Parks. Whether the conclusion is accurate or not is left up for questioning. Gene Patterson and WATE….Can they ever get it right?